December 2, 2014 Comments Off on Is your child anxious? “Mommy, why do I worry so much?�? At some point, children with anxiety want to understand why they are suffering from persistent worry. Try walking your child through this infographic. 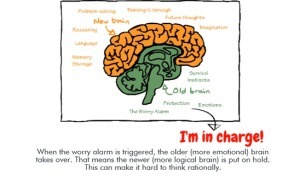 Kids love to learn that worry actually has a very specific purpose: protection. Sometimes this protection mechanism can go a little haywire, but there are ways to come back from the frenetic “flight-or-fight�? mode into a calmer “rest-and-digest�? state. The above linked infographic by no means represents all that you can do for a child with anxiety or panic attacks — but it’s a really good start and it’s simple enough that a school age child could even read it him or herself and understand.